Over the winter of 04/05 Brendon Baillod mentioned to me that he would like to get more information about the little intact schooner that lies in 210 ffw just south of Manitowoc. 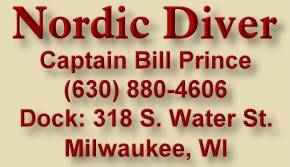 I mentioned this to a few friends who dive off the Nordic Diver and we put together a great group to help Brendon ID the shipwreck. We took overall measurements, searched for a tonnage # and took lots of Images and underwater footage. Bob Broton & Bob Epson are excellent underwater photographers and with everyone's help Brendon was able to make a positive ID. The Gallinipper is one of the oldest dive able shipwrecks in the Great Lakes. Thanks to Brendon for the opportunity to help !! and we all look forward to helping in the future. Somewhere in the depths of Lake Michigan between the ports of Sheboygan and Manitowoc lie the remains of a little schooner called the GALLINIPPER. She would be a minor footnote in Lake Michigan history were it not for the discovery of her suspected remains in May of 1994 by a commercial fisherman. The net-draped wreck in 200+ feet of water with her masts still standing may or may not be that of the GALLINIPPER, but the possibility of her discovery has provoked a number of inquiries that reveal this vessel’s most interesting and colorful history as well as her historical importance. The GALLINIPPER, should she be located, would be a unique relic of Wisconsin’s formative years, with ties to the War of 1812, the Great Lakes fur trading era and the early history of Wisconsin. Her remains would be the oldest ever located for a commercial vessel in Wisconsin waters. The GALLINIPPER’s story actually begins in Pennsylvania in 1774 with the birth of Michael Dousman. Descended from a Dutch noble family, young Dousman quickly became bored with the pastoral farming communities of Pennsylvania and by the age of 20 he had struck out with his eldest brother John Dousman for the northwestern frontier, leaving his father John, Sr. and his mother Catherine in Pittsburgh. Sometime around 1805, the Dousmans settled on Mackinac Island where they took up a career in fur trading. They learned to speak French and quickly established relationships with the local “voyageurs” and Indians and began to prosper almost immediately. John married Rose LaBorde, the daughter of a prominent French trader and Michael, despite being an American, was highly respected by Indian, French and British alike. Michael formed a friendship with the Milwaukee fur trader and founder, Solomon Juneau and soon owned a large portion of what would later become the City of Milwaukee. Dousman gained notoriety during the War of 1812 by saving the lives of Americans at Fort Michilimackinac from an impending British attack. Because of Dousman’s good relations with the Indians, French and British, he was secretly engaged to negotiate with the British and Indian flotilla sent to take the fort. Dousman was taken prisoner by the British but was concerned that there would be needless slaughter of civilians as there had been in other recent attacks. Under duress, Dousman agreed to give the British information about the location of soldiers and reinforcements at the fort. In exchange, the British agreed to postpone their attack long enough to allow Dousman to return to the fort and move all the civilians to safety. Thanks in part to Dousman, the fort was taken without a single life lost, but many accused Dousman of being a traitor, or at least more concerned with his fur trading profits than his country. Despite questions about Dousman’s wartime activities, he became one of the most prosperous and influential men on the western Great Lakes, and by the end of the war, had established trading stations all over Lake Michigan. He eventually owned significant tracts of land down the Wisconsin coast and throughout the Straits of Mackinac. Dousman continued to prosper and he began to build a fleet of vessels for his fur trading empire. In 1818, he bought his first vessel, the schooner TIGER of Detroit, to transport his furs to eastern Great Lakes ports. Other vessel acquisitions followed, including the schooners MINX, MARINER, WAVE and the brig AUSTERLITZ. Dousman even owned a significant share in the ship MILWAUKIE. In 1832, Dousman commissioned the building of his first new vessel. He christened her NANCY DOUSMAN, after his daughter. She was built at Black River, Ohio over the Winter of 1832/33 and was launched with two masts and a scroll stem. Her dimensions were 69.0 x 20.6 x 7.0 ft. with a carrying capacity of 85 and 56/95ths gross tons by the builders old measurement system. She was the first vessel to be built by Master Carpenter William Jones. William Jones was the son of Augustus Jones, an early and noted shipbuilder on Lake Erie. Augustus Jones’ five sons all became shipbuilders and the Jones family would become a Great Lakes shipbuilding dynasty. Brothers George W., Frederick N. and Benjamin B. Jones all went on to become prolific shipbuilders, constructing over 100 vessels between them. April 21st 1834. The schooner "Nancy Dousman" arrived in the morning from below. A change of weather supervened. Wind N. E., with snow. The ground is covered with it to the depth of one or two inches. Water frozen, giving a sad check to vegetation. April 22d 1834. This morning develops a north-east storm, during which the "Nancy Dousman" is wrecked, but all the cargo saved: a proof that the harbor is no refuge from a north-easter. The wind abates in the evening. – Henry Schoolcraft – 30 Years with the Indians. - July 11, 1835, the schr. Nancy Dousman, 85 59/95, Capt. James Shook, sailed from Buffalo for Green Bay with a cargo of food stuffs, pipe and shoes. - April 28, 1836, schr. Nancy Dousman, Capt. Richard Sutliff, sailed from Detroit to Milwaukee with bulk consignments for G. D. Dousman, M. Dousman and others. - October 28, 1836, schr. Nancy Dousman, 85 59/95 tons, sailed from Detroit to Milwaukee with a cargo of sundries, articles, stoves, cows, copper boiler, iron pots, cittles [sic] (the specific articles consigned to M. Dousman at Mackinac). In the Summer of 1835, Michael Dousman sold a minority interest in the NANCY DOUSMAN to Detroit merchant William Brewster and to Buffalo merchants Pratt & Taylor. The group ran the vessel primarily between Buffalo, Detroit, Mackinac and Lake Michigan ports under the command of Captain Nash. In 1838, she sustained significant damage in a stranding a Mission Point on Mackinac Island, and on October 16, 1840 Dousman sold his controlling interest in the vessel to William Dickson of Black Rock, NY who placed her under the command of Captain John Browning. By 1840, Lake Michigan was no longer a wilderness and Dousman could see the end of the fur trading era fast approaching. The growing town of Milwaukee presented many new opportunities, prompting Dousman to relocate his operations there. Dousman would eventually have four vessels named after his family, including the schooners NANCY DOUSMAN (qv), MICHAEL DOUSMAN (built Milwaukee, 1843), ROSE DOUSMAN (built Milwaukee, 1856) and GEORGE D. DOUSMAN (built Cleveland, 1857). Michael Dousman’s son George would become a prominent grain merchant and land owner at Milwaukee, his son Talbot would found the town of Dousman, Wisconsin and his son Hercules would be one of the founding fathers of Prairie Du Chien, Wisconsin and Wisconsin’s first millionaire. Michael would serve as a Delegate to the Michigan State Constitutional Convention in 1835 and his sons would do likewise for the State of Wisconsin. Daughter Jane Dousman would marry prominent Milwaukee physician and businessman Erastus B. Wolcott and daughters Nancy and Elizabeth would marry French fur traders. By the time of Michael Dousman’s death in 1854, Lake Michigan had been transformed from a mysterious, unexplored wilderness into a freshwater freeway and the Dousman family had played a major role in shaping it. The importance of the Dousman family in the history of Wisconsin and Lake Michigan is consequently hard to over-estimate. On August 11, 1843, the NANCY DOUSMAN once again came under ownership of the Dousman family when she was purchased by Captain G.C. Vail of Milwaukee for Mr. George D. Dousman. Dousman tried to run the vessel in the grain trade, but the little ship proved too old and small to compete with the larger vessels being built on Lake Erie, and in March of 1844, she was damaged in a stranding on Lake Michigan. She was christened GALLINIPPER, after a fast flying, Mosquito-like biting insect. She was likewise a two sticker with a scroll head, but was considerably larger at 95.0 x 21.8 x 7.9 ft. with a carrying capacity of 144 and 89/95ths gross tons by the builders old measurement system. The GALLINIPPER was brought out by Captain George W. Ford and ran primarily out of Milwaukee in the Lake Michigan lumber trade. On August 27, 1847, Captain Smith sold the GALLINIPPER to Milwaukee investors Joseph Smight, Hiram Barber, and Urick H. Persons, while he continued as her master. She ran without incident until the unlucky date of July 7, 1848 when she was blown down off Beacon Island near the Beavers by a freak July gale. She was upbound, light when the blow laid her on her beam ends, disabling her. Captain Smith was able to flag down the propeller ONEIDA, which took her in tow and pulled her into the shallows at Beaver Island. She required extensive repairs and re-rigging, with an overall bill of $3,300, which was nearly half the vessel’s value. 1851 would bring even worse troubles for the GALLINIPPER, finding her sunk at the mouth of Milwaukee Harbor on May 10 with another $300 repair bill. She was pumped out and promptly put back in service. The schooner CROOK examined the vessel shortly after her capsize and found that she had righted herself but had sunk by the bow with only ten feet of her stern still above water. A few days later, Captain Badenoque went in search of the GALLINIPPER aboard the CLEOPATRA. He scoured the area of her last position, hoping to free her from her bonds, but she had gone to the bottom. She was fully insured and N. Ludington & Co. recovered their $5000 investment in the vessel, but the GALLINIPPER was gone beyond the reach of salvage. For over 140 years, the GALLINIPPER received little attention, until May of 1994, when commercial fisherman Mike LeClair fouled his nets on an unknown obstruction in deep water between Manitowoc and Sheboygan. LeClair attempted to free his nets and inadvertently brought up the mast of a 19th century sailing vessel. Intrigued, he donated the mast to the Rogers Street Fishing Village Museum at Two Rivers and called local divers to free his nets. Divers Bob Duchrow, Steve Radovan, Kent Bellrichard Jim Brotz, John Steele and George West made trips to the wrecksite and Duchrow and Steele made the deep, treacherous dive to the wreck. The wreck appeared to be a wooden schooner of early design, showing very little wear. It appeared as though she had gone down early in her life. Unfortunately, low visibility, equipment problems and entangling fish nets described as “an underwater tennis court” prompted the divers to abort their dive early. Is this deep wreck the historic GALLINIPPER? The historical record provides a number of clues, but none appear conclusive. If the reported historical depth of 40 fathoms is to be believed, one wonders how the rigging or masts could have become stuck on the bottom, as the GALLINIPPER’s masts were only about 100 ft. high. Perhaps her anchor lodged beneath her and prevented her from being towed. There are certainly a number of other eligible candidates for the identity of the wreck, including the brig ABIAH, lost in the same area on September 4, 1855 and the bark SUCCESS, lost nearby in September of 1863. However, sport divers have recently begun visiting this wreck and in May of 2002, her wheel was reportedly removed by trophy collecting technical divers. It is indeed sad to see this potentially historic vessel being robbed of clues that could establish her identity and possibly provide Wisconsin with a tangible physical link to its fur trading era.